Ex-sugar addict Nicki Waterman, the face of GMTV fitness, describes how and why she beat her sugar habit – and how you can too. The Sugar Addict's Diet is a brand new nutrition plan that will help you lose weight and eliminate ailments by eliminating sugar entirely from your diet and increasing your levels of good fats to bust those cravings. 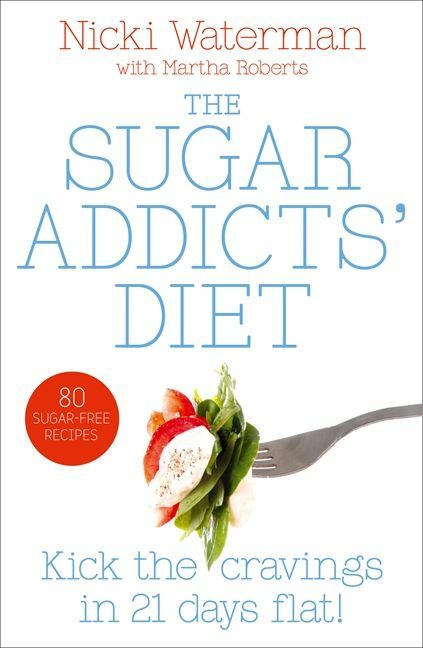 Nicki Waterman's struggle with her own sugar addiction introduces this excellent and topical diet book. Refined sugar is the big baddie in our lives – food companies and marketing executives are making the ‘cocaine of the food industry’ enormously difficult to avoid. Hidden sugars are everywhere and Nicki helps you to negotiate your way around the pitfalls on supermarket shelves. • Discover if you are a sugar addict by checking your symptoms – are you overweight, lacking energy, suffering headaches, irritable…? • Learn how sugar contributes to major health issues, including obesity, diabetes, cancer, depression, candida, acne and a host of other problems. • Understand the physical and emotional aspects of your addiction and what the real cost to your well being is. • Cope with ‘sugar dealers’ – people and situations that could set you on the wrong track. • Lose weight and stop cravings by increasing your intake of the right fats – follow Nicki and Martha’s easy-to follow 14 day plan with delicious recipes. • Win the sugar war with your kids by helping them choose healthier options – and defeat the marketing industry’s ever-present and invasive temptations. Nicki Waterman is one of the media's very favourite media faces and she is a continuous source of press cuttings and features. She is also the fitness presenter on GMTV, in particular Inch-loss Island. Nicki is author of Nicki Waterman's Flat Stomach Plan. This is her first diet-focussed book. Martha Roberts is a nutritionist and the new health journalist of the year. She regularly writes for newspapers including The Sun, The Mirror and The Express and contributes to magazines such as Now, Top Sante, Shape, Zest, She and Glamour.